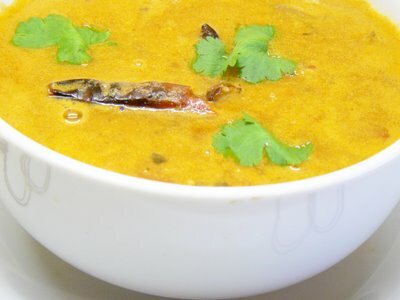 Sambar or sambhar is a South Indian cooking recipe, made of lentils, usually red gram, and vegetables. The regular Sambar Recipe is usually poured over or alongside steamed rice. Several minor variants exist depending on the meal of the day, region, and the vegetable used. The regular sambar recipe without significant vegetable content is called Saru in Karnataka. 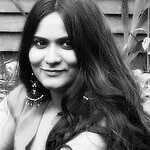 Saru without lentils is called hunise saru (tamarind saru), which becomes menasina saru (pepper saru) if pepper is added. 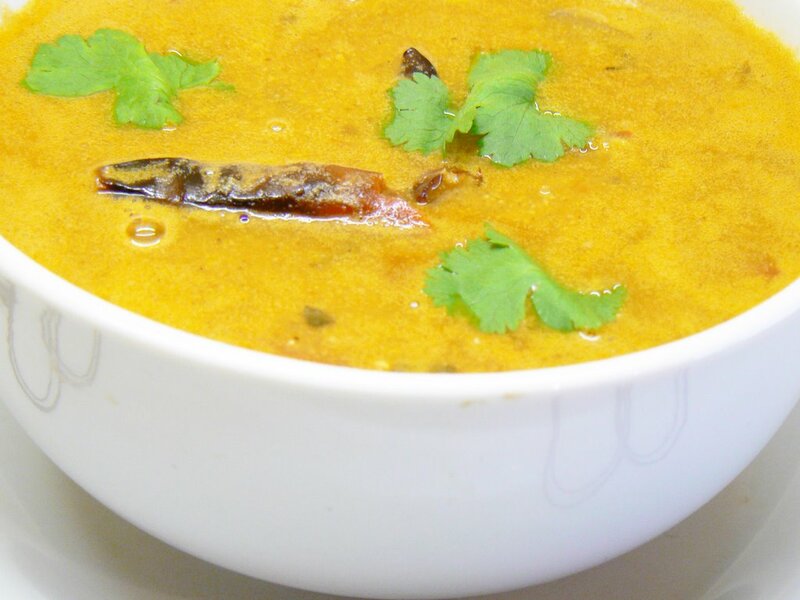 Sambar without lentils (but with vegetables or fish) is called Kozhambu in Tamil Nadu. There are major and minor variants of kozhambu (mor kozhambu, vetha kozhambu, rasavangi etc). Note that there are minor but subtle differences in preparation between all the variants. For instance, whether the vegetables are added to the tamarind water or vice versa, which does make them taste different. 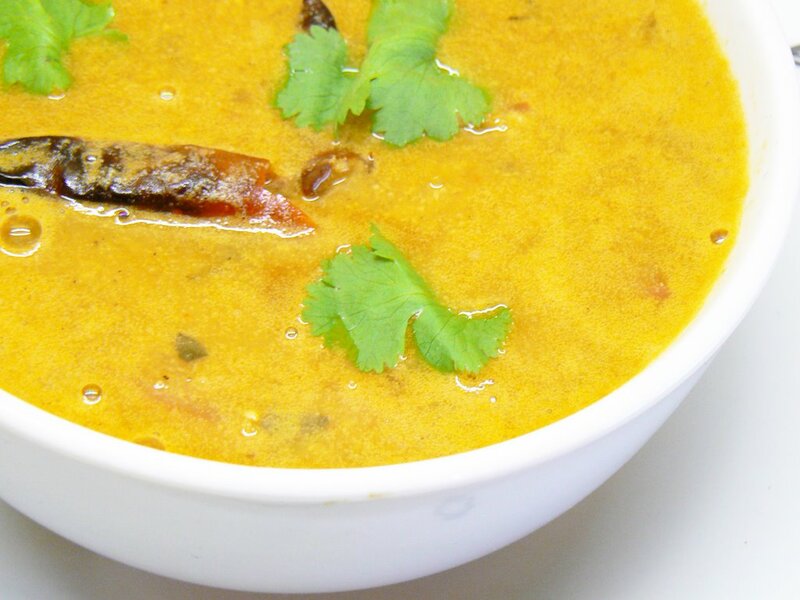 Sambar with rice is one of the main courses of both formal and everyday south Indian cooking. It is also served with idli, dosa and vada. It is not uncommon to eat sambar rice with Happala(papad). Sambar is the most loved dish in my home. May its Idli or Dosa or just plain rice, Sambar always accompanies them. There are variations to this sambar recipe, but this is the one I use quite often. Heat 1tsp of Oil and roast the above ingredients until golden. Fry 1 onion and 1 tomato separately with little oil. Grind everything with grated coconut to a smooth paste. Heat Oil in a shallow pan and fry the small onion for 1 to 2 minutes. Add enough water and boil it till soft. Cook red gram dal in pressure cooker and mash well. Mix cooked onion, mashed dal, tamarind extract, tomatoes, green chillies and ground paste with salt and enough water and bring it to boil. When the sambar is thick enough remove from fire. Heat oil and add mustard seeds, red chillies, curry leaves and hing. When mustard starts spluttering add this seasoning to sambar. Serve hot Sambar garnished with chopped coriander leaves with Rice, Idlis or Dosas. HI SIA, THANKS FOR THE WONDERFUL RECEIPE. I MADE A DOUBLE BATCH OF THIS SAMBAR AND WE LIKE IT. ITS DIFFERENT THAN USUAL SAMBAR THATS WHAT I WANTED. I MADE SOME MINOR CHANGES REDUCED CHILI ETC IT TURNED GOOD. KEEP IT UP!!! I always check out your recipes before finalizing on anything. They are all simply amazing. Great collection and work. Keep it going... However I would like to comment on the design of this page. It would be more presentable and convenient if the page is simple and less cluttered there by improving the response times too.